Sen. Chris Murphy (D-CT) launched a talking filibuster about two hours ago at 11:20 a.m. ET on the Senate floor. He was quickly joined by fellow Senate Democrats in a collective effort to pressure Republicans to accept legislation that would deny suspected terrorists from purchasing firearms and require universal background checks. 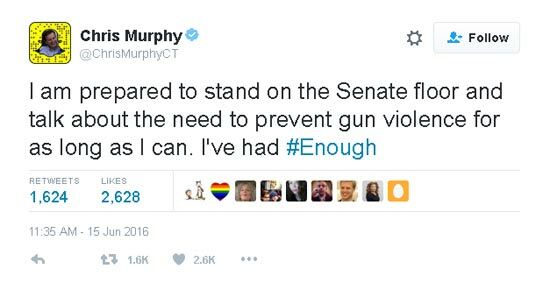 "I am prepared to stand on the Senate floor and talk about the need to prevent gun violence for as long as I can," Murphy tweeted this morning before taking the podium. "I've had #enough." Murphy's motion comes three days after the Orlando massacre that killed 49 individuals and injured dozens more in the worst terrorist attack on U.S. soil since 9/11. The Connecticut senator's sentiment toward keeping guns out of terrorists' hands echoes that of Donald Trump. The GOP presumptive nominee also posted on Twitter this morning that he would be meeting with the National Rifle Association (NRA) about disallowing individuals on the "terror watch list" to purchase firearms. Sadly, the victims were only US citizens, whose right to life is not as important as the right to bear arms. This is the way the people of the US want it, as they consistently vote in representatives who fail/refuse to take meaningful action or even amend the constitution. Here in the UK I'm not even permitted to carry a lock knife. I feel safer because statistically I am a lot safer.